﻿ World Superbikes: Max Biaggi: "That was my chance"
World Superbikes: Max Biaggi: "That was my chance"
Max Biaggi believes he lost the chance of taking an emphatic double race win and closing the points gap even further to series leader James Toseland when he nearly ran into the back of Troy Bayliss on lap 17 at Vallelunga. 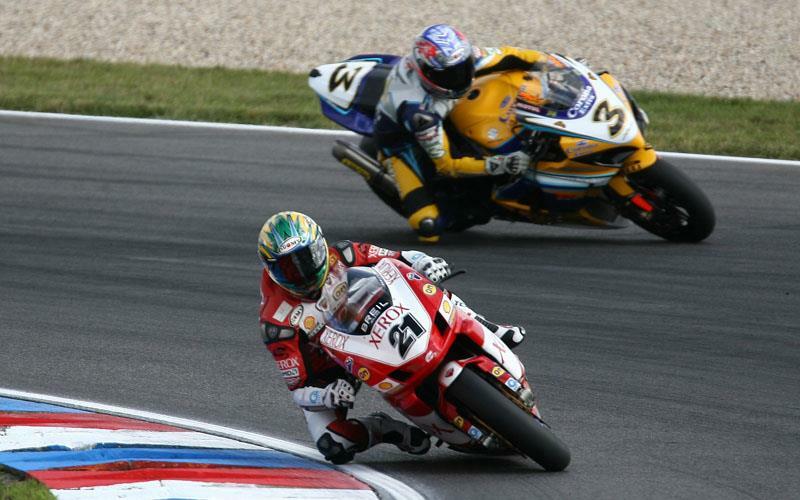 After a slow start to race two in Italy, Biaggi passed Lorenzo Lanzi, Troy Corser, James Toseland and Haga to close the three second gap to the leader, Bayliss. By lap 15 he was just 0.155seconds behind the Ducati man but the moment Max Biaggi had to take evasive action to avoid collecting Bayliss on the way into the tight first gear hairpin his challenge for his first ever double win was over. Speaking to MCN, Max Biaggi said: “It’s difficult to say if it cost me the race but it was definitely a chance. “It wasn’t at the end of the race so my tyre still had grip so there was still a possibility to keep pushing. When I caught Bayliss I was braking deeper than him at this turn and when I caught him I decided to wait a little but I then the front started to tuck on the way in. “I was getting closer and closer to him so I had to pick the bike up and run wide. It was very difficult to avoid running of the track and the front was jumping because I was braking so hard. “I think I lost more than half a second at this point (lap times reveal that he lost 1.5 seconds). “I found the energy to come back at him but then towards the end I completely lost the front and had to pick the bike up on my knee and then it was so difficult to close the gap. World Superbikes: Max Biaggi - "It looks like you're stuck with me for another year!" Max Biaggi finished the Kyalami test an encouraging eighth fastest onboard the all new Aprilia RSV4.